The majority of companies and government agencies have a large, dispersed IT infrastructure, which means that systems operate in silos, often with duplicate functionality. Despite recommendations from analysts, organizations have made little progress in managing their portfolios. As the most obvious cost-cutting alternatives vanish, organizations must ultimately find out what kind of systems they possess. Is your organization struggling with identifying IT cost savings opportunities or having difficulties keeping portfolios in line with defined business objectives? If so, an application portfolio management (APM) service may be used to perform rapid inventory analysis for an improved view of complexity, inefficiencies, and application maintenance costs. CAST Highlight enables rapid portfolio discovery and analysis - identifying technical vulnerabilities and opportunities to reduce IT cost. Rapid inventory of 100+ applications in 1 week. Fact-based discovery of portfolio vulnerabilities and cost drivers. Reduce the cost and complexity of application portfolios with confidence. Click Here: Analyze Your 10 Most Critical Applications Free. 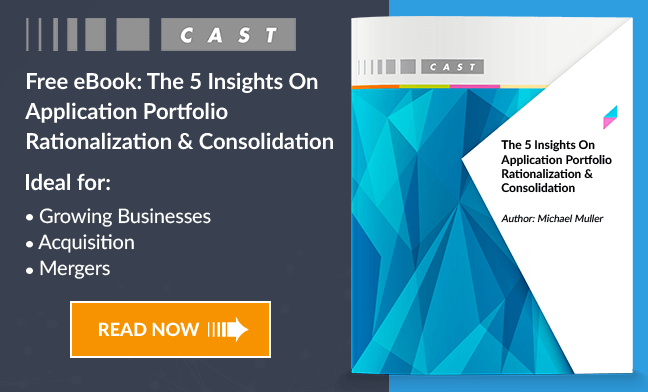 What is Application Portfolio Management (APM)? Information obtained through proper application portfolio management can be used to determine where improvements should be made and how, based on the justification of measurable factors. If application portfolio management is proving to be a struggle for your organization, CAST offers a fast, accurate solution to provide objective insight that increases business value from your deployed applications.